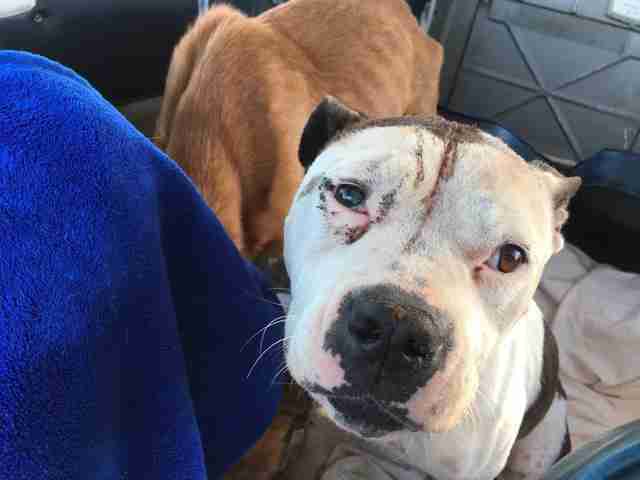 "Kimber came right up between the seats, and I knew right then, she had to sit next to me." 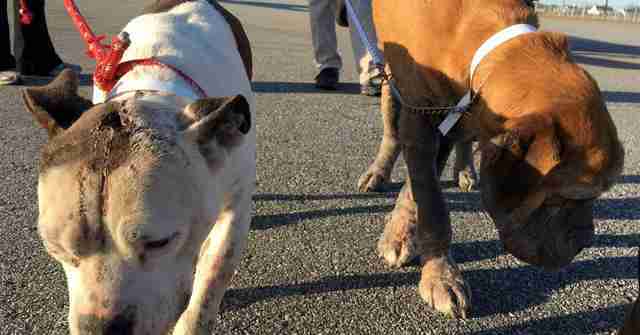 When dogs cross the tarmac to board Paul Steklenski's plane, there's often a sense of relief. They're usually coming from a shelter and getting on a freedom flight to families and rescue groups in other parts of the country. It's the beginning of a new life. 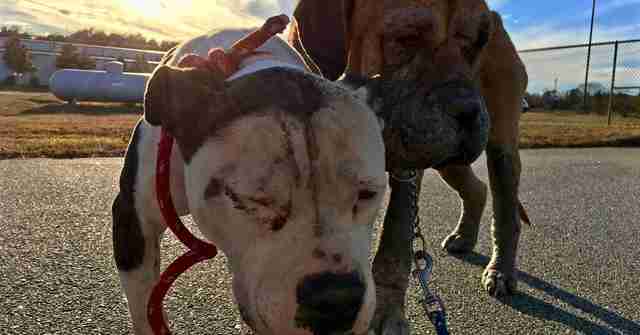 But for Kimber and Rocky, they couldn't quite shake their old lives - the ones that saw them beaten and brutally neglected. 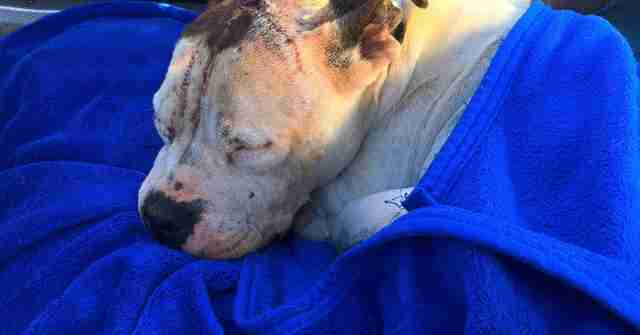 Kimber was still recovering from a gunshot wound. Understandably, it took them a while to get across the tarmac. "It was difficult. Both were completely emaciated. They could barely walk," Steklenski, founder of Flying Fur Animal Rescue, tells The Dodo. "That was hard. Just getting to the airplane, we had to stop several times as we were walking to let them do their thing to get to the airplane. But Steklenski had all the time in the world for them. 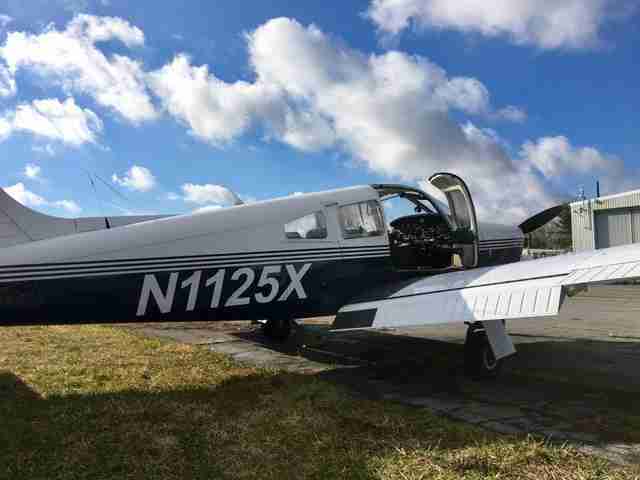 And, although they came from different nightmares and had only met for the first time at the Rocky Mount airport in North Carolina, they seemed to understand each other. And lean on each other. 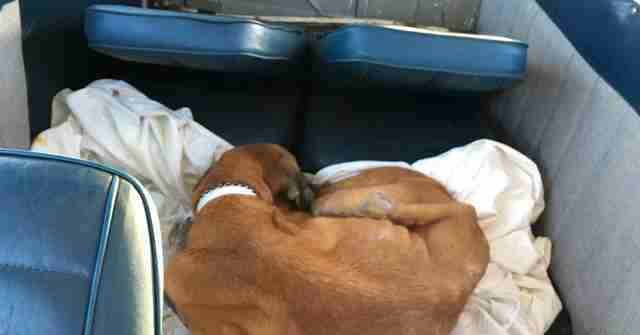 In fact, Kimber even paused a moment to rest her head on her pilot's lap. "For Kimber to go up to me and put her head on my leg," Steklenski says, "I almost lost it right there." Not only did Steklenski have the time for these dogs, but also the space. 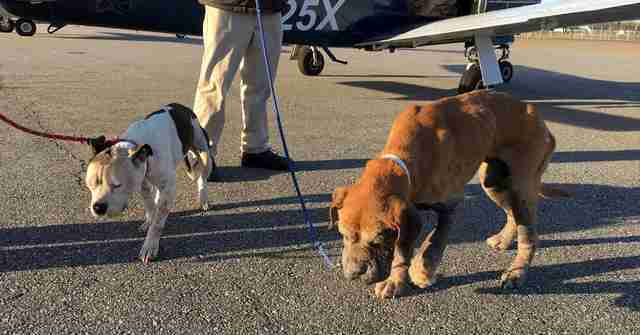 He had reserved the entire rented plane - usually full of dogs - for just these two. And moments after they were airborne, Steklenski, as he often does, slips some music on his headphones, just low enough to hear the dogs in case they're in distress. At about 7,500 feet up, Kimber let him know she preferred to be by his side. "Kimber came right up between the seats, and I knew right then, she had to sit next to me," Steklenski says. "So I put a blanket on the seat and picked her up and the seat reclines back like a car, and I gently put her in the seat." She spent the flight, just a few hours long, either curled up sleeping, or just gazing out the window. "As the sun shone down upon Kimber, I realized 'Shine' by Collective Soul began playing in my headset, as if on point, on cue," Steklenski notes. I'm gonna let it shine, I'm gonna let it shine. "It was difficult, it was so hard," he adds. "Looking at her and the sun setting and Collective Soul comes on. I was losing it." Rocky, meanwhile, curled up comfortably in the back of the plane. "All they cared about was bed and that nobody was abusing them anymore," he says. And when their flight landed in Morristown, New Jersey, volunteers from Rescue Dogs Rock NYC were there to meet them. They didn't take nearly as long to make it across the tarmac. Because there's nothing quite like a few hours spent high above the clouds to help leave the old memories far behind - and embrace the new. Kimber and Rocky will soon part ways, each heading to their own foster home after some much-needed medical attention. From there, they will be looking for a forever kind of situation. Get in touch with Rescue Dogs Rock NYC here. You can also support Fly Fur Animal Rescue in its mission to fly countless animals to new lives by making a donation here.